When we arrive we find out that the family we are visiting has a Matriarch who is 97 years old. The family is from a town in Syria just across the border, where there has been substantial conflict in the ongoing war. Some of their family members, including her son, are still there. Though their home is only a few miles away in Syria, she has not seen him in four years. She says when they talk, she cannot talk long because, in her heartbreak, all she can do is cry. Though she looks small and frail, it is clear she is a strong and wonderful woman, and watching her and Egab interact is beautiful: this younger man, full of joy, completely loving her and she returning that love. It is like they are mother and son. She has adopted him, and he has adopted her (we find out later that Egab’s mother died when he was young). They laugh together. She grabs his face and holds it close, and he does the same with her, as they smile, talk, and look into each other’s eyes. I want her to tell us her story, or, more accurately, to tell us stories. To put her life into perspective historically, when she was born the Ottoman Empire still existed and was just coming to its end, and none of the borders or identities of the present Middle Eastern nations existed beyond regional names and governances. There was no Syria, Jordan, Iraq, Saudia Arabia, etc., as we know them today. She has seen much change and, undoubtedly, much conflict. But in the difference of our languages, it is difficult for us to ask her for stories and difficult for her to tell us. Her son (in his sixties) and two older ladies (daughters, daughters-in-law?) welcomed us and joined us in our conversation. They offer us great hospitality. They serve us coffee, and there is much laughter (Egab seems to cultivate this wherever he goes). Even when Egab, now holding the baby, is emphatically giving directions on how to prepare baby formula to the women behind a curtain to the rest of the house and directly telling the man of the house that he shouldn’t smoke around the baby, there is joy. It is that strange, deep, and good kind of joy found in the midst of tragedy, like when someone has passed away and family members gather to tell stories of life. The Matriarch tells us she has already lost two other sons to disease prior to the war, and now she longs so badly to see her other son. She says that if she could just see him and hold him again, she could rest in peace. One of our fellow volunteers tells her that she is beautiful and asks what her secret is. The Matriarch replies that there is no secret. Then, a moment later, she has one of the women of the house bring out some moisturizing ointment she was given as a gift. She puts it on Egab’s hands, rubbing them gently, which results in laughter from all of us. Then she puts it on his face. Still more laughter. Then she offers to do the same with the young lady volunteers who are with us. Then me and the John. 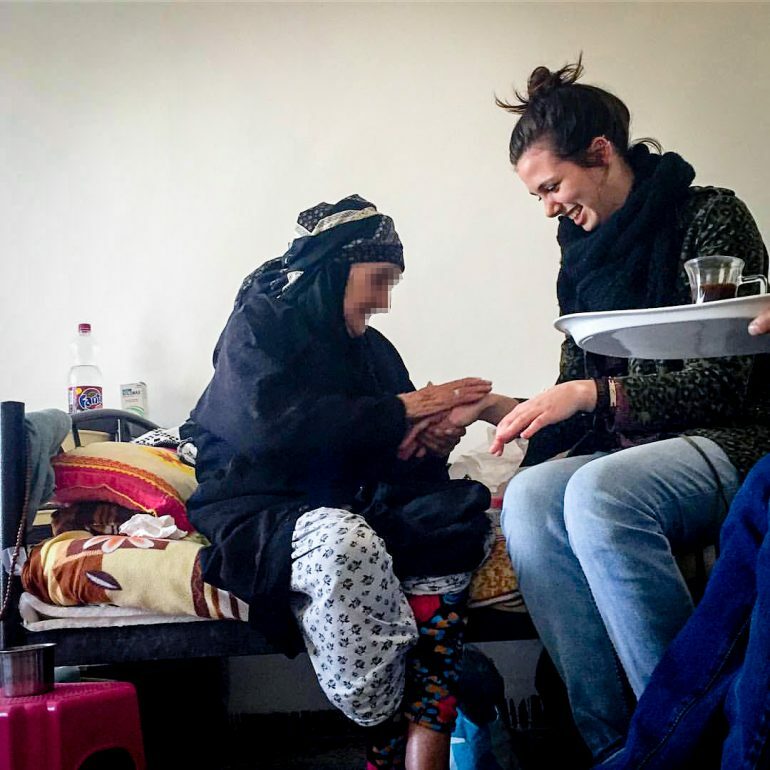 I cannot tell you what it is like: having a 97 year old woman, who is a refugee, who is mourning, who has invited us into her house with the greatest hospitality, for her to lovingly and gently rub ointment into your hands. I can’t convey this, other than to say it was a holy moment. It was a complete honor. We came to love, serve, and learn, and yet she and her family provided the love and service. We sat and received, and we did learn. We learned things that cannot be fully expressed with words. All I can do is tell the story and perhaps encourage others to go and see for themselves.